PRIVACY. ELEGANCE. BEAUTY....The Marseilles. This luxurious, rent-restricted complex offers it all to the few that call Marseilles home. Relax on 200' of sugar-white beach, lounge by the outdoor pool or enjoy the heated indoor pool on a rainy day. 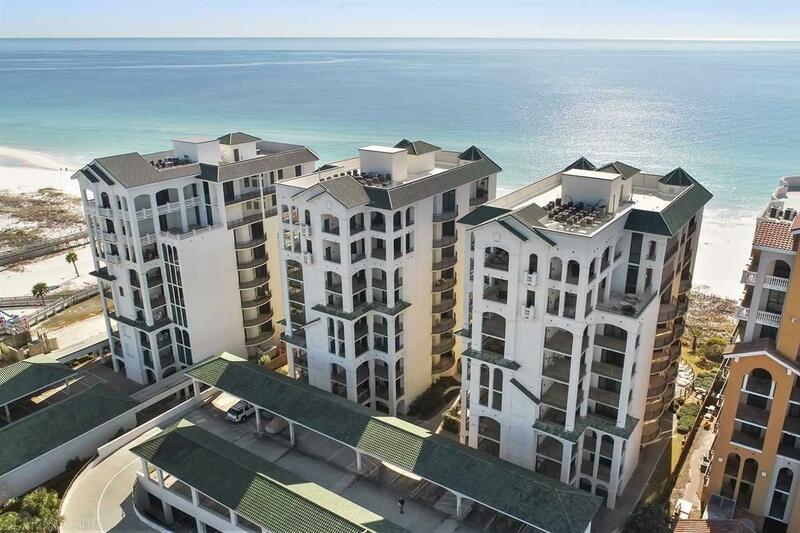 This spacious 4BR/4.5BA residence offers over 2,400sf of living area with a "beach house feel, 4 balconies, south balcony (gulf side) is oversized, offering lots of space to lounge & relax with friends & family while taking in the great views to the east & west along the coastline. The north balcony provides direct access to the 2nd-level covered parking deck where the deeded parking space for this residence is located. Your master bedroom is spacious & has large walk-in closet & guest bedrooms each have their own private bathroom, as well as balcony access. Interior features include: 10' smooth ceilings, crown & base molding throughout, oversized travertine flooring in all of the main areas, upgraded carpet in all bedrooms, laundry room, dramatic floor-to-ceiling windows, European-styled kitchen with island bar-top, granite counters & raised-panel custom cabinets, stainless steel appliances, granite counter tops & travertine surround on jetted garden tub & walk-in shower in master bath, cultured marble in guest baths, high counters & raised-panel custom cabinets in all bathrooms. Marseilles Amenities include: low-density development, indoor (heated) & outdoor pools, sauna & steam rooms, fitness room, ample parking & 2 elevators (coded for security/privacy) that open into a semi-private elevator lobbyall in a gated community! This beautifully-appointed residence is being sold fully furnished. Call TODAY to schedule a viewing of YOUR PERDIDO KEY SANDCASTLE & get started creating memories now! Listing information © 2019 Baldwin County Association of REALTORS® MLS. IDX information is provided exclusively for consumers' personal, non-commercial use and may not be used for any purpose other than to identify prospective properties consumers may be interested in purchasing. Data is deemed reliable but is not guaranteed accurate by the MLS or Coldwell Banker Coastal Realty. Data last updated 2019-04-23T00:27:50.493.